The trick to getting a seat upgrade at the airport is not in throwing tantrums or demanding an upgrade with the check-in staff. It’s in showing up to the game of upgraded ticketing with a plan – and with an attitude that allows a win-win for both sides. When an airline offers you a seat upgrade, you win by getting more space, nicer amenities, and an overall better flight experience. The airline benefits by keeping a customer happy and loyal, and by possibly selling another seat on their plane when you upgrade to the expensive cabin and they offer your cheaper coach seat to another passenger who wants to pay less. You’ll get a better chance of being upgraded to first or business class when you book your flight on days when business users are less likely to fly, such as on bank holiday. When you join an airline’s loyalty program, even at the lowest level, you can get rewarded with seat upgrades before travelers who aren’t part of the airline’s frequent flyer program. We recommend you join multiple loyalty programs, but try to stick to just a handful of carriers if you can. 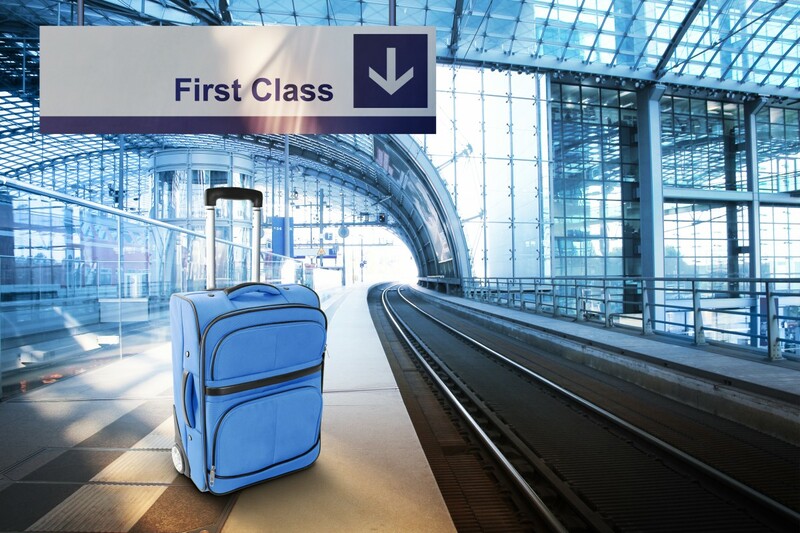 When you get to the airport early, you maximize your chances of getting upgraded when there are only a few empty first-class or business seats on a flight to put passengers on. Get to the airline’s terminal at least 2 hours before your plane leaves. Worst case, if you don’t get bumped up, you’ll probably be able to find a Starbucks to lounge in until you take off (with free Wi-Fi and a yummy Oprah Chai Tea Latte). If you’re running late to the airport (we don’t recommend making this a first approach), go to the check-in counter to inquire about an upgrade if you haven’t already reserved your seat. Again, when running late, don’t go to the self-service kiosk. Ask the check-in agent to put you into any business or first-class seats that might be available. When you have a flight planned, make sure that you check all emails that the airline sends you, even if you think it might be a routine confirmation. Often, air carriers will offer very cheap upgrades (until even an hour before flight time) for seats that haven’t been sold. Sometimes, an air carrier will overbook a flight leaving a passenger bumped. Or, a traveler will have difficulty with their reservation due to company error. In cases like these, politely state that you believe an upgrade to first or business class is a fair exchange for the inconvenience that they have put you through. We heard one story about a traveler who boarded the plane to find an older gentleman sitting in his seat. The elderly passenger stated that he wanted to sit next to his wife, and when the displaced flyer heard this he kindly said that it was okay. The flight attendant heard the conversation and proceeded to put the man without a seat into business class. Showing up asking for an upgrade to business class when you’re wearing your best business attire can sometimes prompt a reservation agents to indulge your requests a little faster than they would otherwise. Perhaps they take your business more seriously – or maybe they’re just enamored with your style. Either way, it’s been known to work. If you’ve flown a lot on a particular airline, paid a lot in baggage fees, or otherwise spent quite a bit of money with one air carrier, it may work in your favor to inquire about upgrades (and mention your monetary loyalty). Many passengers report receiving upgrades simply by being chatty and friendly with the staff. Try engaging everyone you encounter at your airline’s terminal with pleasant conversation (it comes across more genuinely if you actually try to make an honest connection). Compliment the check-in agents on something, chat with the airhostess before takeoff, and share humanity with more people than you might normally.